It is always refreshing and inspiring to cover the Smart Wireless Engineering Education Program (Sweep) Innovation and Excellence Awards. The annual contest pits engineering schools throughout the country in a contest on the use of mobile technology to solve community problems. Anyone in despair at the state of education in the country need only to spend an afternoon among these kids to rekindle hope. These kids are awesome hackers (in the original meaning of the word). This year’s winner is an all-women team from the Mapua Institute of Technology. Their project was a device that rendered text messages into Braille and a cane that can detect obstructions and then warn its user. The team of Janiena Roxanne Dirain, Kristine Emy Matabang and Girly Perando with mentor Ayra Panganiban got P500,000 for the win. Their school got P500,000 in grants. SEEING a blind masseuse crouching silently on a corner with a cellphone held to her head gave three graduating Mapua Institute of Technology engineering students the idea for an undergraduate project and thesis. Dirain, Girly Perando and Kristine Emy Matabang exchanged looks and decided right there and then on the subject of their undergraduate project under adviser Ayra Panganiban. The three decided to find a way to render text messages into Braille and devised a lunchbox-sized gadget comprising of a microcontroller and a GSM module. The gadget renders text messages into Braille letter by letter, with the device popping up dots to make up the letters. 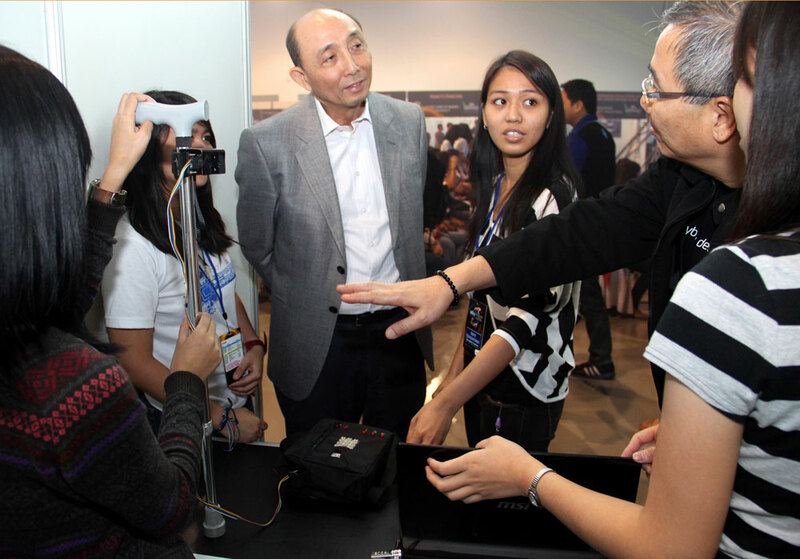 The project, “Wearable Obstacle Detection System and Braille Cellphone for the Blind,” won P500,000 for three students and another P500,000 in grants for the school during the Smart Wireless Engineering Education Program (Sweep) Innovation and Excellence Awards Wednesday at the Mall of Asia in Pasay City. Perando said they added an obstacle detection system, set up in a cane, to provide more assistance to the blind. The system detects obstructions of up to five meters away and alerts the blind user via vibrations. The alert becomes more frequent the closer the obstructions become.